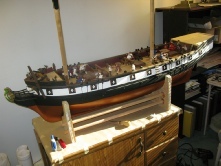 I’ve been working on two radio-controlled model ships over the last several years. You can read all the details in each ship’s build log. 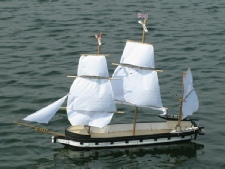 The Beagle was my first r/c model ship, scratch-built starting in October of 2010. The hull and figurehead were hand-carved from a pear tree limb. She made her maiden voyage on July 2, 2011. A good learning project for getting into the hobby of r/c model sailing ships. The Theresa Marie is being built from SC&H’s cruiser class brig kit. This model is big: 7 feet long and 6 feet tall. The kit was ordered in June of 2012. ETA for first sail: spring of 2017. I’ve made a huge amount of modifications on the kit so it’s taking way longer to build than anticipated.